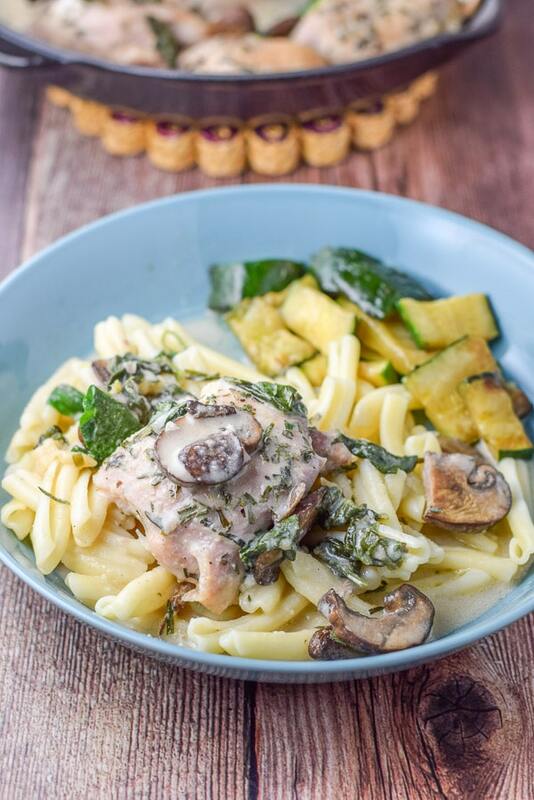 This chicken in creamy mushroom sauce recipe is so delicious and satisfying! It’s healthier than the average creamy sauce because I use almond milk! You can also substitute cream if you want. Christopher and I could eat it each and every week! Not sure why I am telling this story because it’s not a pretty one. In fact, it’s not a super fun memory for me, but you know what? I’m glad I had this experience, because if I hadn’t, I would not have the appreciation I have today for eating meat. One summer we were at our vacation home up in New Hampshire. Our next door neighbors, who had chickens, asked us for help slaughtering them. I was creeped out to say the least, but truth be told, I was also kind of intrigued. My sister Nancy was gung-ho about it and wanted to be out in the yard helping. I did not want to do that, so my sister Robyn and I stayed in the kitchen where we would do the second plucking. The first plucking happened outside after the chickens were ‘processed’; meaning, their heads were chopped off, they ran around the yard, then Nancy helped fetch them so they could be dunked in scalding water and plucked of the big feathers. Robyn and I plucked all the feathers that the peeps outside missed. I wouldn’t recommend going out of your way to see chickens being slaughtered. It was an interesting experience and obviously a necessary process for peeps who are going to eat meat. Instead of just seeing meat in its packaging at a grocery store, you can appreciate that it belonged to living animals. I know, I know. Not something you want to hear before you look at this delicious recipe, but there you go! It’s part of life. My mom made chicken Marengo that night and let me tell you, I did not enjoy it as much as I usually did. But I did gain an appreciation and respect for the process it took to get that chicken on the table that I never had before. I preheat the oven to 350 degrees Fahrenheit. 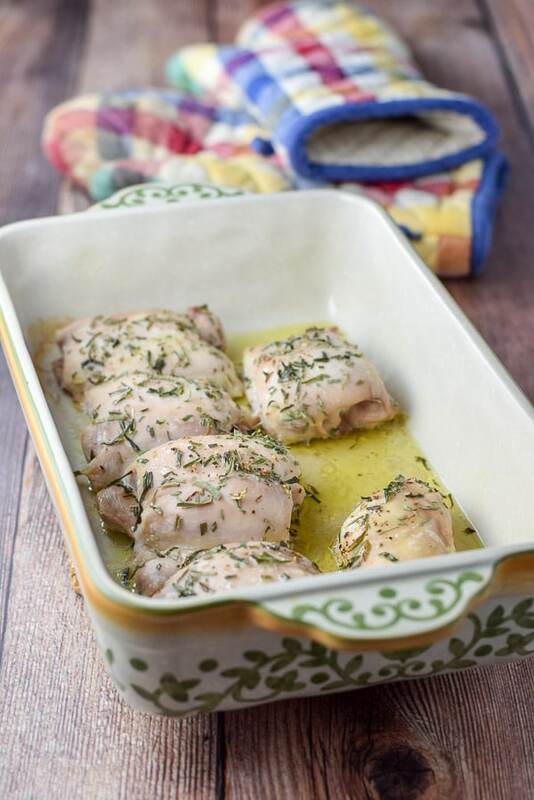 I grab my baking dish and dribble olive oil on the bottom. Then I lay the boneless chicken thighs down in the dish and sprinkle tarragon on top. I also sprinkle on some salt and pepper. The last thing I do is dribble more olive oil on top. Into the oven it goes. I set the timer for 30 minutes. Ten minutes before the chicken has finished baking, I grab the mushrooms and sauté them on medium/high heat for 5 minutes. The medium high heat makes the mushies nice and brown. I gather the ingredients for the cream sauce. Here they are: Parmesan cheese, garlic paste, chicken broth, wine, and almond milk. I get my smaller dutch oven and heat it on medium. I add the milk, broth and wine and let it come to a near boil. 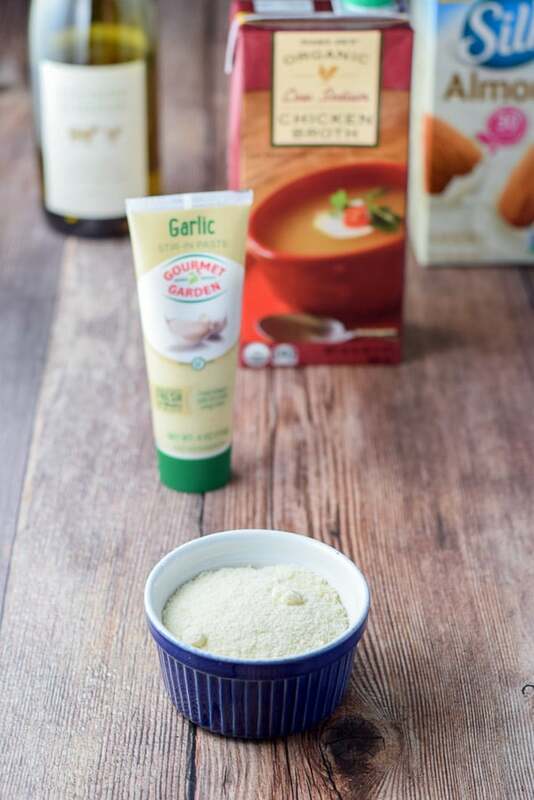 Also, I add 1 teaspoon garlic paste (equivalent to 1 clove of garlic), 1/2 teaspoon salt and Parmesan cheese. I whisk it until the cheese has melted. Now, since I’m using almond milk, the sauce won’t be quite as thick as it would be if I were using light cream but that’s okay by me. Time for me to add the spinach and stir it around until it has wilted somewhat. Time to serve the chicken in creamy mushroom sauce. I scoop some pasta in the plate and spoon some chicken on top! I also scoop some sautéed zucchini on the plate. Mmmm. Delish. 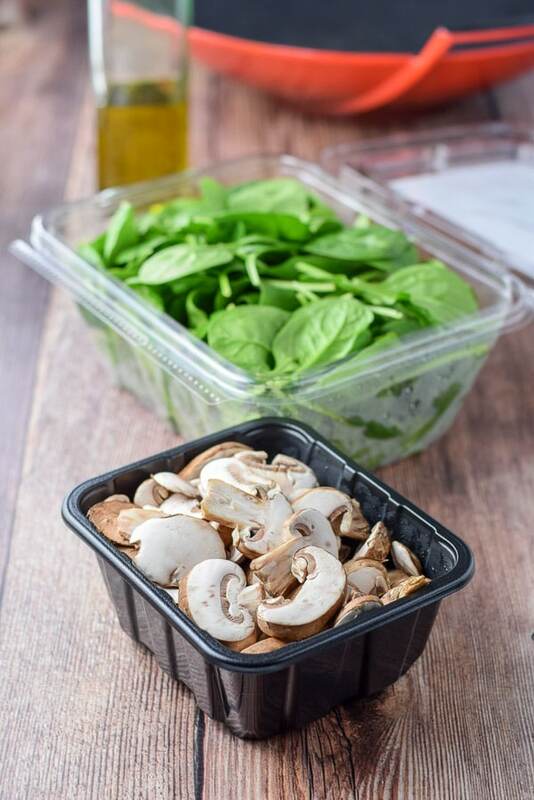 Let’s get a closer look at that creamy mushroom and spinach chicken. 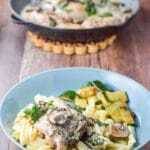 I hope you enjoyed this chicken in creamy mushroom sauce recipe! Please leave me a comment! Tell me what your favorite chicken dish is! 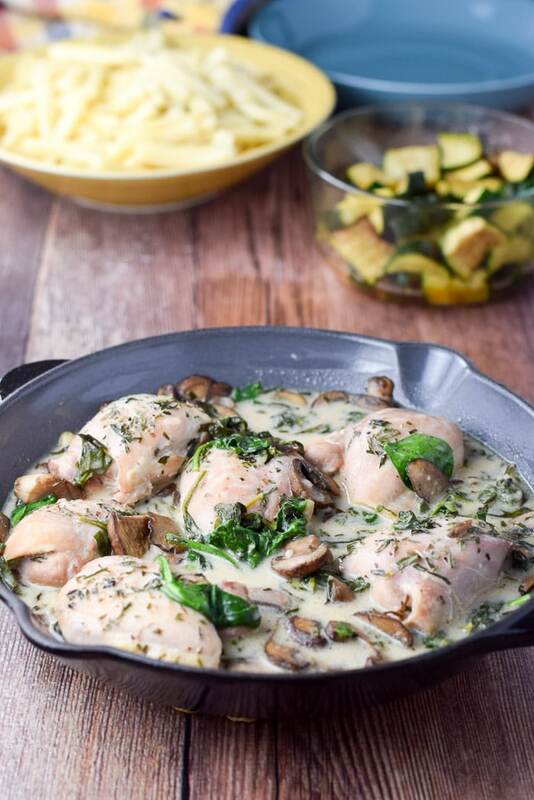 If you’ve tried this chicken in creamy mushroom sauce or any other recipe on the blog, I’d love the hear what you thought about it in the comments below. I love hearing from you! You can also FOLLOW ME on FACEBOOK, TWITTER, INSTAGRAM and PINTEREST to see more of my delicious food and delightful cocktails! 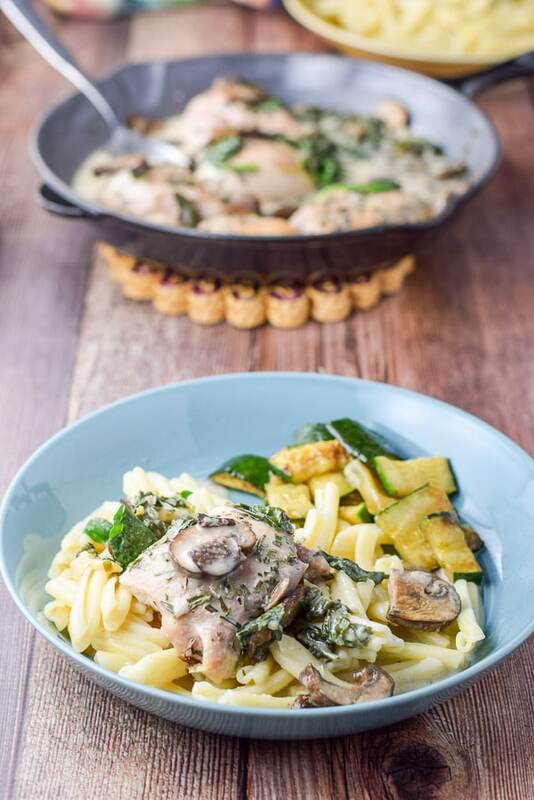 This creamy chicken dish is so good, not to mention pretty! This is soooo delicious. OMG. My new favorite dish. And so easy…. but seems so fancy on the plate. I love anything that has mushrooms in it. 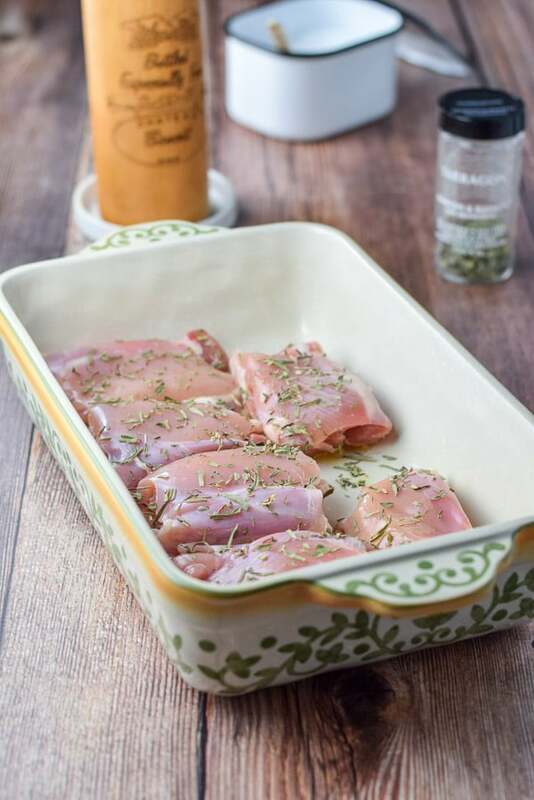 These chicken dish looks appetizing that i want to whip it up in the kitchen right now. Sanna! 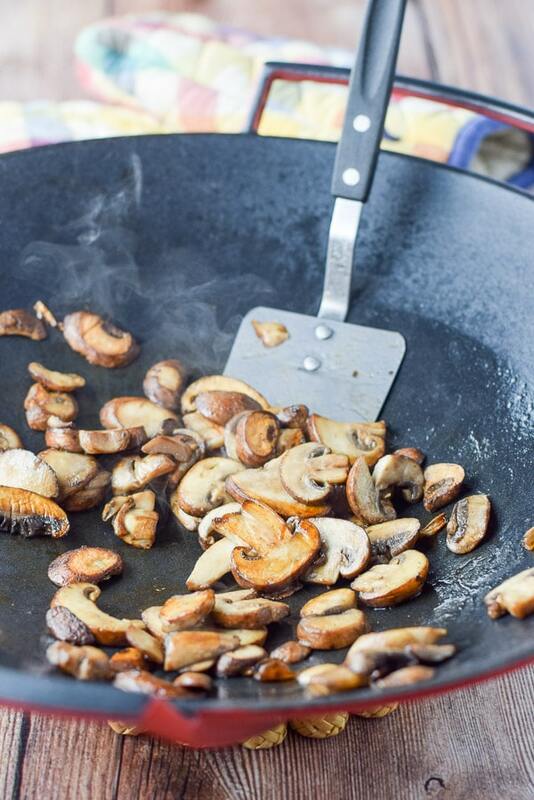 I love anything with mushrooms in it too! Enjoy! This looks like total comfort food! YUM! Cedrik, I love spaetzle! My grandmother made it all the time! Do tell me how yours came out! You are a dear! I’m so glad you let me know how it turned out! I use tarragon all the time, especially with chicken. Fun that they call it Estragon where you are from! Just checked out your decanters and chemex coffee decanters. I’m going to buy the 3 cup! What fun! Thanks again for the comment! To the recipe(s): Well, thank you for sharing them! You are giving me quite some ideas. They are still on the to-do-list because I can’t make much time for cooking at the moment. We had a few sunny days here in Hamburg and since that is pretty rare (the weather usually is “London style” or worse :D) I want to spend as much time in the sun as I can afford. Looks like there are a few rainy days ahead so I might take this as an opportunity and try the spinach quesadillas & the chicken marsala. I always thought it was called chicken masala? Or is this another type..? Let me know how your first experiences are with the Chemex and if our guide is of any help. I usually recommend going for the bigger versions of Chemex like the 6 cup or 8 cup (10 cup is a bit huge) so that you can use it when guests are over. Simply, because you can also make (only) a couple cups in the 6 cup by using less of everything and it doesn’t do any harm to the coffee (my experience). Thank you SO much for catching that. I updated the recipe – it is 1/2 cup grated parmesan cheese. I hope you like it! !